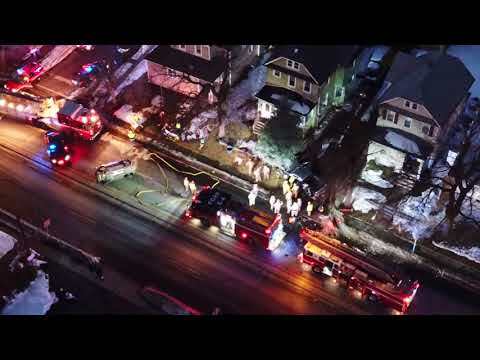 RIDGEFIELD PARK, N.J. -- (UPDATE) A 62-year-old Clifton man was hospitalized after being extricated from his truck following a three-vehicle collision that jammed Route 46 in Ridgefield Park during Wednesday's evening rush. Police were investigating a report that a reckless driver might have been responsible, Lt. Joseph Rella confirmed. Euripides Rodriguez, 62, was behind the wheel of the Toyota Tacoma that struck a utility pole before slamming into the retaining wall of a residence on the stretch of highway known as Winant Avenue. His injuries weren't considered serious, the lieutenant said. Rodriguez's passenger, 61-year-old Carlos Correa of Elizabeth, also was removed from the vehicle by firefighters, Rella said. He wasn't injured, the lieutenant said. A Jeep Renegade driven by Dominica Felici-Skal, 43, of Hackensack ended up on its side in the middle of the westbound road, Rella said. She got out on her own, he said. Also involved was a Nissan Altima driven by Amany Gad, 35, of Garfield ( see video above ). No summonses had been issued as of Wednesday night, Rella said Thursday. Westbound Route 46 traffic was detoured at the NJ Turnpike/Route 80 ramp, with some directed through an eastbound lane to a turnoff. Eastbound traffic was backed up past Teterboro Airport. An investigation was continuing, Rella said.